November 1997: "Volunteering is an excellent way to explore a career," says Sarah Grimm, education coordinator for BRING Recycling. Five years ago, as a "career waitress" at Delfina's in Portland, Grimm took a master recyclers class through OSU extension. Her work schedule allowed time to volunteer for non-profit recycling programs. "Do what you love—the money will follow," says Grimm, who was soon working full-time for Metro Recycling's telephone hot-line. She was enticed to Eugene in 1996 by BRING's offer combining lower pay with increased responsibility. Now she hauls a trash-can full of ideas into area classrooms to teach the three "R"s—reduce, reuse and recycle. BRING's goal to reach 10,000 students in 1997 was surpassed before Earth Day in April. Grimm welcomes opportunities to speak on recycling, composting, and earth-friendly shopping. 2013 update: After years of speaking to groups outdoors and in classrooms full of kids, Grimm's voice gave out at the Country Fair in 2003. "I had surgery on my vocal cords," she says. 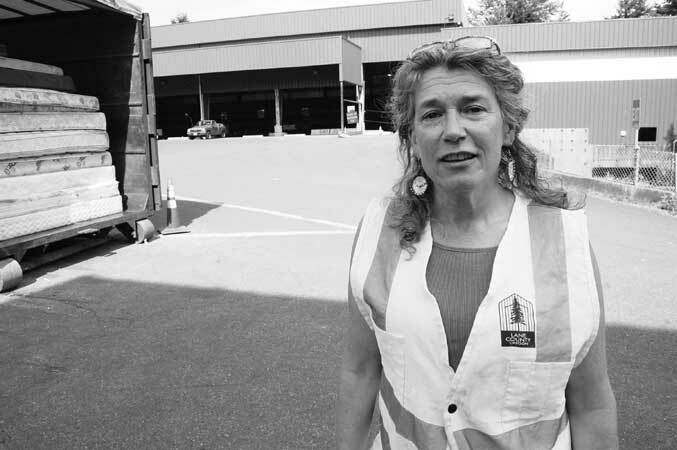 She found quieter work managing Lane County's Master Recycling Program, and she now coordinates the County's Waste Reduction Program. "I manage recycling contracts, education, outreach and advertising," she says. "But I still have a basement full of scraps for craft projects."